Madrid is on the threshold of heaven. This is what the inhabitants of the Spanish capital say when describing their city so rich in culture, art and atmosphere. The completion of one of the largest construction projects in Madrid’s history underlines henceforth the heavenly reputation of this metropolis. Liberated from the noise and smell of the busy city highway, which was completely banished under ground, both banks of the Rio Manzanares were transformed into picturesque parks and promenades. The heart of this green idyll is the Pasarela del Arganzuela - a footbridge designed by France’s star architect Dominique Perrault. The tapering conical forms on both sides of the bridge, wrapped in stainless steel Escale mesh manufactured by the internationally leading technical weaver GKD - Gebr. Kufferath AG create a shimmering helix. 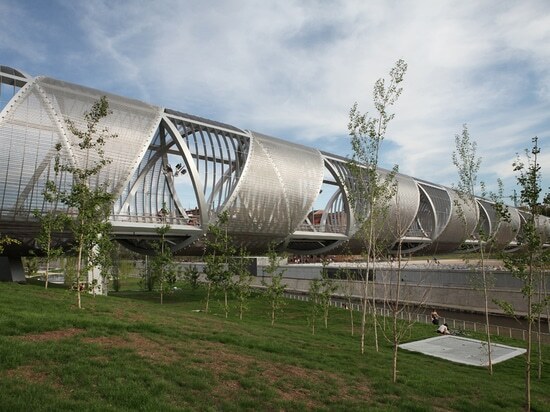 The metal mesh surrounds the bridge from end to end in a spiral design like a textile ribbon. 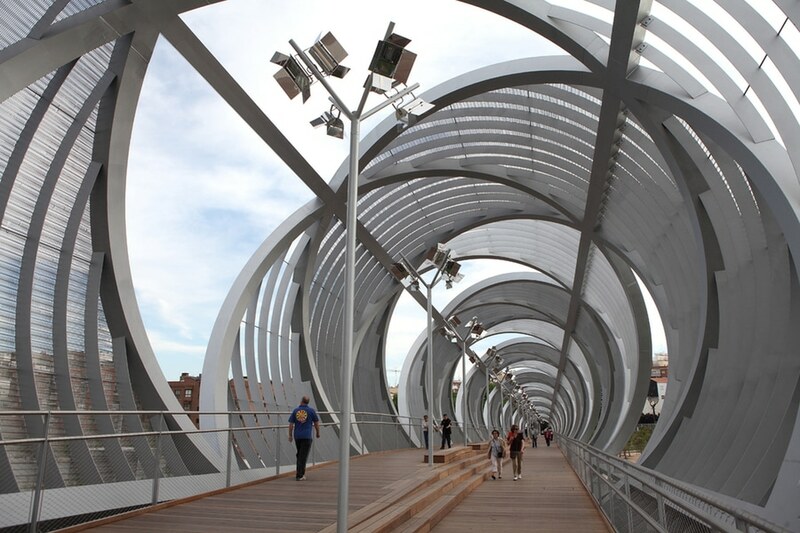 This helix, which gleams silver in the sunlight, is a metaphor for the increasingly close association between the two parts of the city separated by the Manzanares. At night, it is transformed by backlighting into a golden spiral, floating mysteriously above the river. 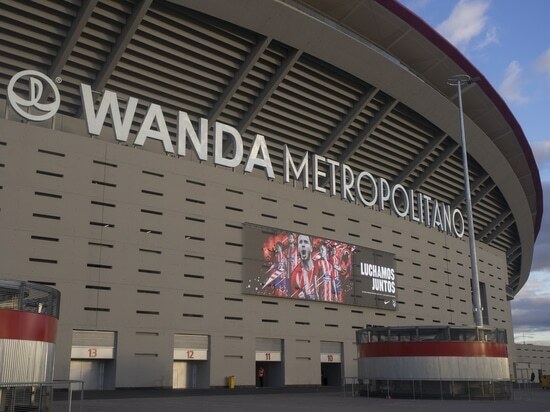 Two years ago Madrid celebrated the opening of the Centro Deportivo Multifuncional del Manzanares with its spectacular Caja Magica. 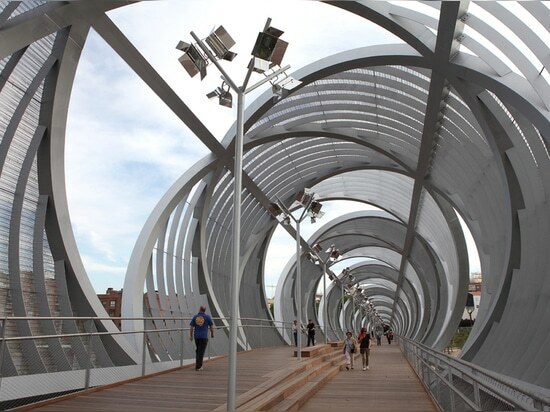 Now, with the 250 metre long Arganzuela Bridge, Perrault has created a crossing for pedestrians and cyclists and an iconic structure for the Manzanares Park. Following his typical strategy of creating the unfamiliar, Perrault makes the bridge deck in its traditional form invisible. The visual key to his unusual installation is a reflecting envelope of metal mesh, through which the bridge, despite its considerable size, seems to dissolve into its surroundings. Rather than a single compact structure, Perrault has designed a self-supporting steel structure in two sections, tapering to cones at their outer ends. At its highest point in the centre the bridge diameter is twelve metres; at both pointed ends only five metres. Pillars at the sides underline the impression of a floating link between the two banks. The two spiral-wrapped sections - 150 and 128 metres long - extend well into the park, meeting in the centre on a platform. It forms in fact the entrance to the park, a visible sign of the merging of the two parts of the inner city. The unmistakable character of the bridge is created by the helical form of the envelope. The symmetry of logarithmic spirals has fascinated architects, mathematicians and artists from time immemorial. The helix is universally accepted as the symbol of stability and growth, and in its double form the symbol of life itself. Perrault understood his earlier design for the multifunctional tennis centre not as an isolated structure, but as a multi-faceted reanimation of the historic landscape on the banks of the Manzanares. The Arganzuela Bridge is a systematic extension of this idea. In this case the unusual design symbolises the exchange with the natural world around it as well. The realisation of the concept is made possible by the decoratively draped skin of semi-transparent metal mesh, which links inside and outside and creates different impressions depending on the viewer’s perspective. At the same time it permits a natural illumination and airiness of the bridge. In combination with the timber planks of the bridge floor, the dialogue between nature and high-tech can be experienced at several levels. The spiral-shaped wrap is designed so that an open section on one side is always opposite a mesh-wrapped section on the other, allowing passers-by a view into the surrounding landscape all the time and preventing gusts of wind from making the bridge impassable. 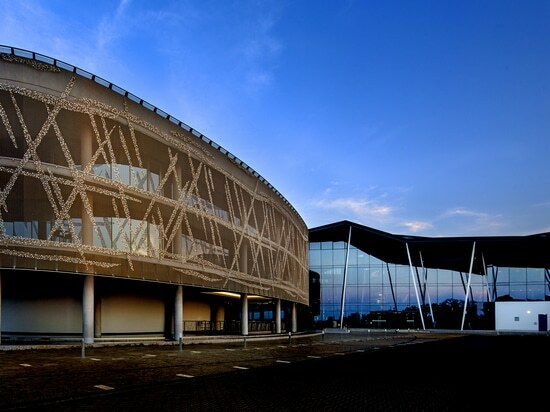 To create this architectonic idea, once again the client chose to work with GKD, the world’s leading technical weaver for architectural and metal mesh applications. 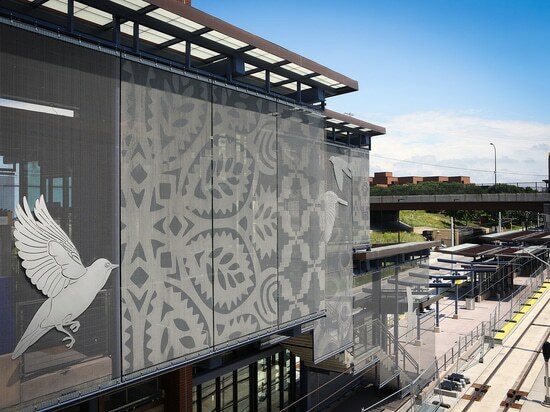 Perrault selected GKD’s metal mesh for the first time almost 20 years ago for the Bibliotheque de France, to implement his concept of wrapping buildings in an envelope. And with the multifunctional tennis centre nearby Perrault again relied on the proven skills of GKD to come up with the solution. For the Arganzuela Bridge he used the Escale 7 x 1 spiral mesh he had used before to wrap the indoor tennis courts. The flexible nature of the stainless steel spirals even covers three-dimensional structures seamlessly. 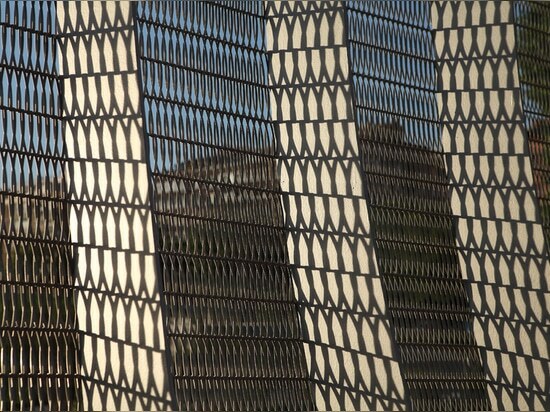 The spectacular wrapping for the Arganzuela Bridge used 4,500 m2 of this mesh type. 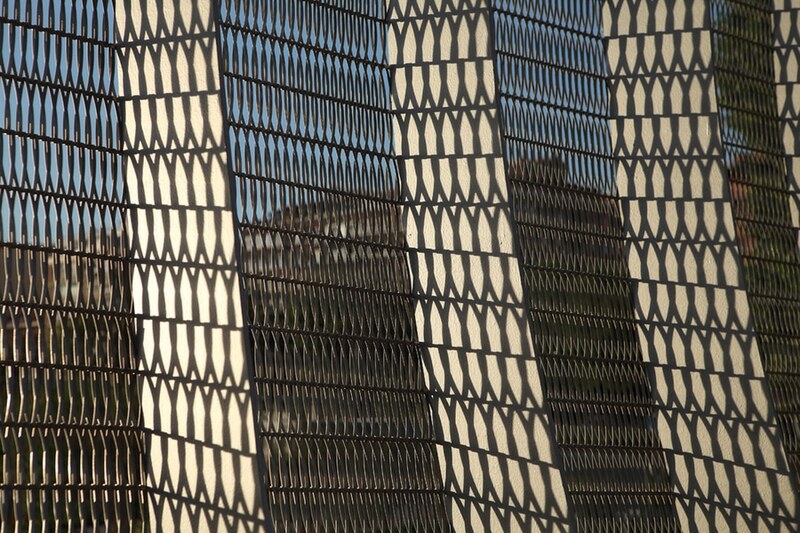 The conical form of the structure and the two-dimensional curvature of the mesh that it dictated posed unique challenges for GKD's manufacturing subsidiary in Spain, Finsa Arquitectura. The solution comprised 64 individually formed triangular mesh sections, each adjusted to fit the sub-structure - 30 for the northern and 34 for the southern half of the helix. As well as the visually seamless design of the three-dimensional form, Perrault laid great store on the precisely defined light and air permeability of the spiral membrane. Assembling the finished mesh panels also required high precision work due to its size and triangular shape. Each mesh triangle was mounted by crane from top to bottom with precisely defined bending in vertical and horizontal directions, to achieve the required tension. Because of the complex form of the bridge, the widely proven fixing technique using eye bolts was adapted to the design requirements. The hypotenuses of the unequal sided triangles were fixed to the sub-structure with inserted flat sections. The mesh is tensioned by eye bolts, which, at the inclined sides of the triangle, were mounted on the 7 mm thick connecting ribs of the spirals. The finished bridge owes its charm to the special aesthetic of the spiral mesh, which reinforces the impression of a delicately draped material. On the inside of the bridge the softly dappled light creates a pleasant atmosphere. In combination with the Spanish sunlight, the mesh reflects the colours of the day and the seasons through the two-dimensionality of the stainless steel membranes. When it is dark, the woven helix is backlit by standing lamp fixtures invisible from outside, transformed into a golden ribbon whose soft gleam conveys the magic of the new togetherness. Apart from this iconic aesthetic, the functionality of the Escale mesh was a deciding factor for Perrault in selecting the material. 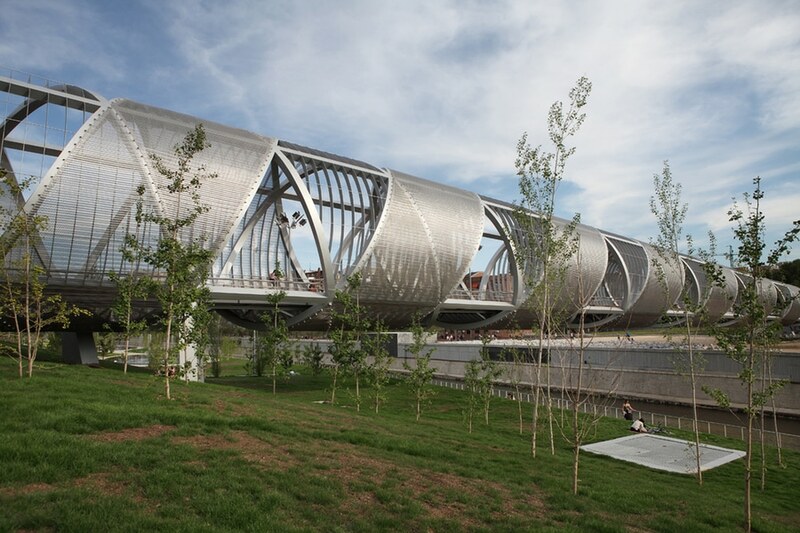 Despite its filigree structure, the membrane protects bridge passengers from the sun - an essential feature in view of Madrid’s sometimes extreme weather conditions. The transparency and permeability of the structure also ensure the necessary daylight and rainfall for the landscape beneath it. 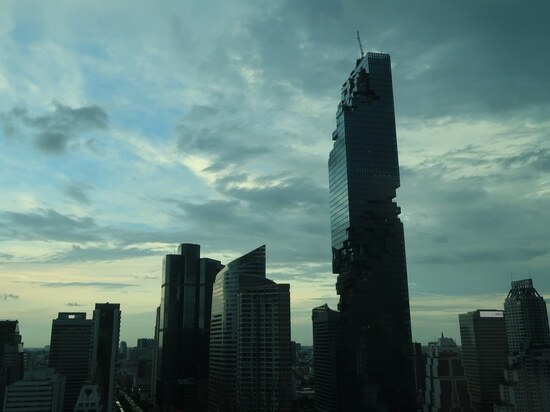 Not forgetting the inherent advantages of the stainless steel material, which makes the Escale mesh easy to maintain and resistant to severe weather or environmental impacts. The resulting virtually unlimited lifespan means little burden on the city's budget, already heavily strained by the rerouting of the highways and the design of the parks. Stainless steel mesh type Escale surrounds the bridge in full length, creating a shimmering helix. © GKD/ARTEUNO WELT SL. On the inside of the bridge the softly refracted light creates a pleasant atmosphere. © GKD/ARTEUNO WELT SL. The mesh ribbon permits a natural illumination and ventilation of the bridge while at the same time offering protection from the sun. © GKD/ARTEUNO WELT SL.